PokerTracker 4 is a dynamic tracking and analysis program that is compatible with almost all of the major online poker sites. 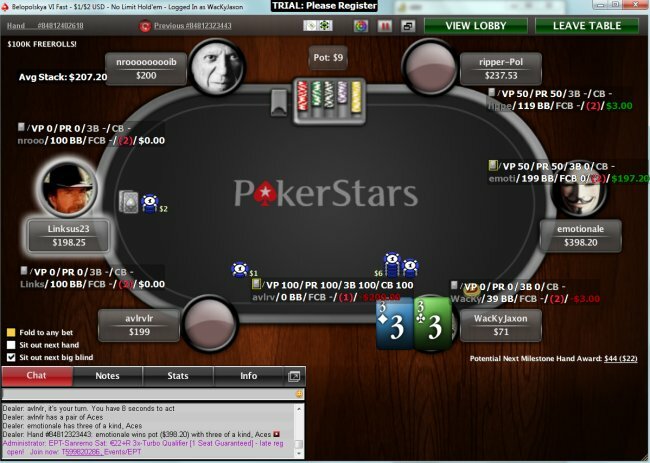 The PokerTracker franchise has been around for years and its newest incarnation was rolled out in mid-2012. We recommend PokerTracker 4 to all serious poker players who want to improve their game and track their results. PokerTracker 4 is a dynamic tracking and analysis program that is compatible with almost all of the major online poker sites. The PokerTracker franchise has been around for years and its newest incarnation, rolled out in mid-2012, is among the most comprehensive and powerful programs in the online poker industry. 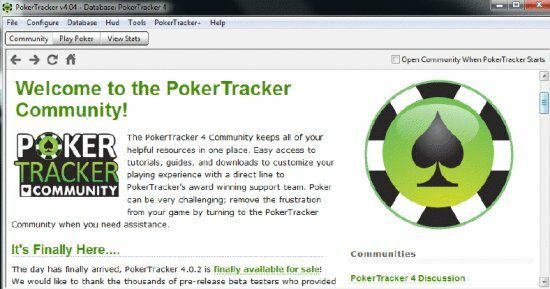 PokerTracker 3 will continue to be supported and sold for the foreseeable future and is the only avenue Mac poker players have to enjoy PT until PokerTracker 4 for Apple’s OS X is released in late 2012. 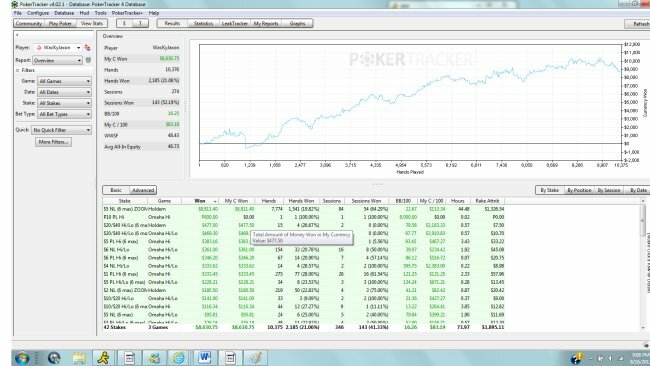 New PT users are encouraged to use PokerTracker 4 if they have a Windows machine, although PokerTracker 3 will continue to be sold. You can install PokerTracker 4 in full for a 30-day trial period before committing financially. Assuming you are satisfied, there are two editions available for purchase. First, a Small-Stakes version imports hands up to $0.25-$0.50 No Limit or Pot Limit Hold'em or Omaha cash games, $0.50-$1 Limit Hold'em or Omaha cash games, and up to $22 buy-in tournaments and sit and gos. This version is priced at $59.99 for Hold’em or Omaha, or you can pay $99.99 and get both forms of poker. The Full version of PokerTracker 4 costs $99.99 for Hold’em or Omaha, or you can pay $159.99 and get both forums of poker. The Full version allows importing of hands from games at any stakes. Each purchased registration code is valid on two computers. You can download PokerTracker 4 onto any Windows-based computer until the OS X version comes out later this year. Mac users can also use PokerTracker 4 provided they have the Windows OS installed by using Apple’s Bootcamp or a Virtual Machine application such as Parallels. It is very straightforward to configure site importing and importing any old databases you might have from PokerTracker 3 or Holdem Manager 1/2 using a setup assistant. The "View Stats" tab is primarily for reporting and post-game reviews and is separated out for cash game hands and tournament hands. There are also global reports for game, range, statistics, and scatter graphs. Tournament players will be happy to see that PokerTracker 4 includes both all-in equity adjusted winnings and the ability to overlay net adjusted winnings. This is a new feature which incorporates independent chip modeling and hand equity to create a theoretical prize adjusted winnings display. It is also simple to customize existing reports and create new ones from scratch within the "My Reports" tab. There are plenty of statistics to choose to create your own custom HUD from or you can utilize one of the standard layouts for your play. The Vector HUD Engine is the name for the scaling display that allows for the resizing of tables without affecting the layout of your HUD by automatically adjusting the text size of the statistics. It is easy to view total database statistics and then apply any filters you want to. A new feature of PokerTracker 4 is the ability to tag hands using the HUD tag menu for future review. There are several new features included in PokerTracker 4 that were not included in previous versions. 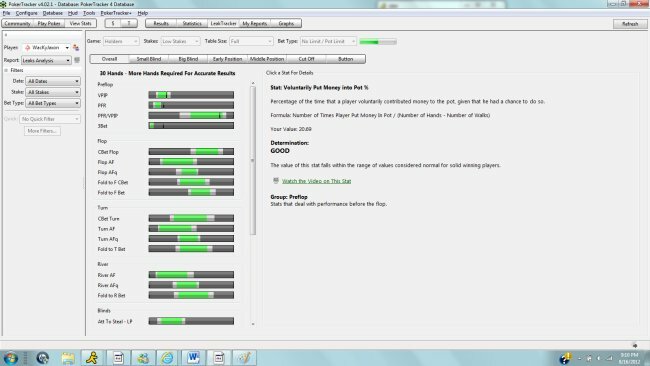 The NoteTracker feature automatically takes real-time notes on your opponents' play based off preset or customized definitions. LeakTracker enables cash game players to quickly identify their own strengths and potential leaks that need to be worked on. Thus, PokerTracker 4 can quite literally pay for itself. The Independent Chip Model (ICM) simulation tool enables tournament and sit and go players to review optimal push/fold strategy and ICM calculations from any final table. The Equity Calculator enables you to easily analyze your hand’s equity against an opponent’s range of hands from the PokerTracker 4 hand replayer. It is the only equity calculator built into a tracking tool that works with both Hold'em and Omaha. To summarize, PokerTracker 4 was designed to help players become more productive while playing, while also simplifying their post-game review in order to improve. Download PokerTracker 4 today. PT4 is great for those starting out and even more so for experts trying to refine their play and playing situationally against other players. It is also a great analysis tool and very user friendly!